Oregon grape species extend north to the limits of Devil's Club and south to the limits of Chaparral. All three plants have strong medicinal actions which overlap and complement each other. Their respective strong antimicrobial and antiectoparasite activities have made them extremely useful in combating disease organisms large and small. All three have a long history as medicinal plants. 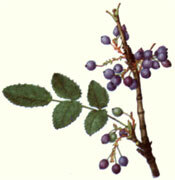 Each has special defense mechanisms to discourage casual herbivory: Devil's Club has fearsome spines and emetic actions; Oregon Grape has very sharp spines and varnished hard leaves; Chaparral has no spines but covers itself, leaves and stems, with a thick pungent resin that is so repugnant that no North American herbivore eats it (only US Army-imported camels have been observed voluntarily eating chaparral foliage) even though its food value is comparable to alfalfa. Devil's Club to me is the most interesting North American medicinal plant. Perhaps the indigenes thought similarly as evidenced by this plant having the most different names as a medicine plant. It was known as medicine far from its native habitat which extends from coastal Northern California up to Alaska (it is sometimes called "Alaska Ginseng") and inland into the coastal ranges and Northern Rockies; it occurs east of the Rockies only on Isle Royal in the middle of Lake Superior, where it is debatably either an amazing relic of nature or of native medicinal plant propagation, and in a few relic populations in Manitoba and Ontario. It has therapeutic power in all realms. Many years ago I clumsily asked Ellen White, a Nootka elder and traditional healer, for what ailments the Nootka use Oplopanax; she replied "for everything", with obvious exasperation. Even though I had been harvesting and using the plant for 15 years at that time, I was and am still a beginner in the study of Oplopanax applications. Devil's Club is in the Araliaceae, the family of ginseng, Siberian ginseng, sarsparilla, and devil's walking stick. 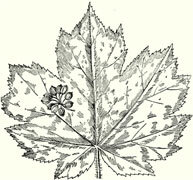 Structurally, devil's club most resembles Siberian ginseng: spiny jointed upright, usually unbranched, thin stems with large palmate leaves spiny on both surfaces. I believe its chemistry and actions are much more complex than those of Eleutherococcus. The wood and spines of devil's club are much sturdier than Siberian ginseng, and its spines on the stems are devastatingly painful: they are flat and penetrate like micro daggers through human epidermis and lodge there. Frequently within 36 hours of penetration, small Staphylococcus eruptions or boils will appear developing around every site of devil's club spine under the skin. The traditional treatment is to apply strong decoction of devil's club as fomentations or rinses and to drink several clamshells of the same decoction daily. Other-sourced topical boils are treated similarly with devil's club decoctions taken internally and applied externally. These subdermal spine pieces are nearly impossible to remove because they have little or no internal wood fiber which might aid tweezer extraction. I have found that Swiss-made jeweler's forceps ( the very fine-tipped sort used to pick up and position individual jewels for jeweled-movement watches) #4 by Dumont& Sons to be the only tweezers that have worked to pluck out devil's club spines; often, they are excavated in pieces rather than neatly pulled out with a triumphant flourish of dexterity. In the wild, devil's club occurs in both small patches of upright spiny stems 6-15 feet tall with huge spiny leaves 2-3 feet across in apical terminal clusters , and in huge rambling masses of ferocious interwoven recumbent and upright spiny stems covering acres and sometimes square miles of wet, shady understory in stable coastal rainforest. Hikers who wander unawares into these huge devil's club patches can panic at the first slash and multiple stabbings and make the experience much worse by running or trying to hurry out of the dilemma, tripping on the recumbent stems and levering the erect stems into their faces and arms. In these moments, the appellation "Devil's Club" seems diabolically appropriate. I harvest it with both caution and extreme respect. The best medicine is made from root and recumbent stem bark harvested after the leaves turn bright yellow in early Scorpio (late October) until mid-March. For purists, some native traditions say harvest devil's club for medicine only in Scorpio, or within one moon after the leaves turn yellow and drop. Coastal peoples would harvest lengths 1-3 feet long and bury them near their dwellings until used. The plant uses fierce mechanical disruption by rushing water, windfall tree rip-ups, and even heavy machinery as a dispersal/propagation strategy: pieces as small as 6 inches long with intact bark can grow roots and sprout small stems and leaves after months of being submerged or just lying on the ground or being buried up to a foot or more in leaf debris or stream gravels. Instead of fearing localized habitat disruption, devil's club thrives in it as long as the greater habitat remains stable. The stability and viability of small pieces with intact bark allows for long-term postharvest storage with probable minor medicinal efficacy loss. For personal use, since I need to travel off island to harvest this plant, I have kept the barked pieces for up to 6 months with no obvious loss of activity. When harvesting Devil's Club, I usually chew off 4-5 square inches of fresh bark from the first piece I cut. This soon puts me in a marvelous mood for crawling around on my knees in wet duff, and, methodically to avoid being stabbed, slowly cutting 24-30 inch pieces and delicately removing the usual moss sleeves and tossing any remnant spines on the stems-turned-to-reproductive root before inserting each piece into a ripstop poly feed bag for eventual laborious carrying out to a logging road. Sometimes I am in such a great mood that I just need to lie down and look up at the towering cedars and fir trees and hemlocks and marvel for 15-20 minutes at the beauty of it all. Rarely, I fall asleep. Rarely, because it is damn cold and wet and usually raining and frequently snowing in the higher elevations and even euphoria has its practical limits. More anon. As soon as I can get the root pieces to a processing place, I carefully brush wash them in pure water (no chlorine, and preferably not out of pipes - free water, not caged and domesticated) and try to get a warm comfortable place to begin the peeling if it is for a dried root bark application. There is some debate about whether fresh devil's club bark is better medicine or whether dried bark is okay. I have used both extensively and I can say with some authority that the grosser actions seem unaffected by drying. The more nuanced body responses seem to develop only in response to ingesting fresh material. This may be why coastal peoples kept the fresh root pieces to chew on daily as a whole-body tonic much in the tradition of ginseng; plus, in the rainforest, keeping dried herbs was a trifle more elaborate than in more xeric habitats such as Hopi land. Contemporary Tlingit claim to have observed bears treating battle wounds by eating Oplopanax. I believe it. I usually have apprentices or a long-time helper to assist me with the laborious peeling of the thick lush, resin canal-filled aromatic bark. We sit around a used linen supply house queen-sized discarded bed sheet with our legs under, and a pile of pieces to be peeled near each of us and the peeled bark pieces, up to 2 feet long as our sharp paring knives glide smoothly down the cambial layer between bark and wood, piling up in the middle of the sheet. When the correct mass has accumulated, it is quickly and delicately transferred to drying racks at 70-80 degrees F for about 96 hours. The mood becomes sensuously pleasant for most participants and singing and smiling predominate as active constituents from the wet devil's club material pass transdermally into our bodies. This glorious activity is contraindicated for those individuals susceptible to both drug flashbacks and post traumatic shock syndrome flashbacks. They may have a severe episode. This susceptibility reflects directly on the expansive traditional uses of Devil's Club ( I use the name both generically and as the plant's personal name, capitalized in the latter instance) as a plant ally for spiritual quests and forecasting and for bringing luck in gambling ( the bark was eaten to bring good luck; special charms were carried for improving chances in marathon winter gambling), fishing (many fishermen would take up to four pieces of devil's club out in their fishing canoes; others in times of very poor fishing would cut 40 pieces of stems/roots, arrange them in a circle, and eat a significant spiral track from one end of each 24-30 inch piece to the other end , over a period of 3 days according to tradition, replacing each spiraled stick after consumption; if one got thru the entire 40 pieces then good luck in fishing was certain to obtain; a certain amount of strong character was helpful since the plant is a strong laxative and can produce profound weakness, and lethargy when consumed for 3-4 days on an empty stomach, making it mandatory to lie down. more anon. ), household tranquility ( a piece of Devil's Club wood was affixed over every dwelling's doorway to ward off unwanted stuff. ), and love (men who rubbed their bodies with the bark and/or ate it regularly were said to be irresistible to women; subclinical studies do not yet confirm).This is another level of medicine. The spiritual powers of Devil's Club are an important part of the plant's healing effects. The belief structure helps in accepting this from such a superficially nasty plant. Men healers wore Devil's Club amulets when invoking spiritual assistance. Entire houses or ritual huts were constructed of long Devil's Club spiny stems for Shamans to prepare for important work and to warn away intruders; some references claim (pers. comm) that certain healers lived outside the village longhouse area in such huts, frequently built into huge hollow western red cedar stumps. This may relate to the apparent fact that Aleut healers regularly autopsied slaves and killed enemies to determine cause of death; student healers studied the body internal thusly. In addition to the more exotic uses cited above, devil's club charcoal was mixed with bear grease for blue skin tattooing. The powdered inner bark was used as a masking deodorant and as a dusting powder for babies tending to "diaper rash". The deodorant application was for the entire house as well as for individuals; the odor of devil's club is very distinctive; for some Anglos the smell is nauseating; indeed, for some indigenes the strong tea was a powerful emetic when mixed with seal oil used ritually for purification. The fresh inner bark pieces were applied to the breast to stop milk flow. A wash or paste made from fresh devil's club berries was used to chase head lice and quell dandruff (?). A strong tea or decoction of the inner barks of roots and or stems was used by west coast indigenes for the following (please note that a general weakness and diarrhea can present at the onset of regular use) to relieve viral cold symptoms, to combat tuberculosis, to combat and cure adult-onset diabetes, to resolve "stomach pain", to treat cancer, as a diuretic, as a topical wash for staphylococcus or streptococcus infections, to re-establish menstrual flow after giving birth, used internally ( strong infusions were consumed exclusively for several days, excluding all food and water) and externally( as a topical wash ) for rheumatism and arthritis, used as a laxative, consumed regularly as a general health tonic, gargled for sore throat and hoarseness, used to quell fevers (after Turner 10). Contemporary coastal peoples use the tea of Devil's Club for: headache relief, fresh or dried bark tea for rheumatism, respiratory ailments, stomach ulcers, hangover cure, internally and externally for staphylococcus infections, to treat and prevent blood poisoning, for gallstone remediation, to cure hyperactive thyroid ( part of the lethargy attributed to consumption of devil's club tea may be due to thyrosuppressive action) A typical modern use is to boil the cut-up pieces from about a foot of root with bark on , in a gallon of water for 20-30 minutes and leave steep overnight, before drinking during the following 2-4 days. Pieces of inner bark are laid into dental caries or post-extraction tooth sockets to relieve pain; hot bark pieces or decoction is used for a swollen gland compress and for black eyes; hot bark strips are laid directly onto arthritic areas; smashed bark pulp is added to very hot baths for relief from rheumatism. Regular chewing of the bark is believed to maintain good health. Powdered bark is taken as a snuff and used topically for all surface afflictions, especially boils, swollen glands, and infections; it is left on as a paste for 3 or 4 hours only, since contact dermatitis can develop if left on too long; the treatment is repeated until affliction resolves. Strong tea (infusion or more often, decoction) is consumed a pint or two per day to relieve symptoms of adult onset diabetes. Seemingly miraculous cures were obtained by indigenous coastal individuals methodically self-medicating with Oplopanax tea. These cases were noticed by public health officials and eventually reported in the medical literature and often dismissed as merely anecdotal or unlikely. Some practitioners did use devil's club in their treatments for diabetes. In practice, the most important use to date is the control of blood sugar. My own long-term personal consumption of Devil's Club indicates to me that blood sugar release or conversion mechanisms are affected; by this I mean that daily available energy levels stay much the same throughout the day and tend not to fade or plunge in the late afternoon when Devil's Club bark is chewed or tincture taken in the morning before food. I have had patients use either the strong tea or powdered bark in capsules (2-4 ,00/day ) between meals to balance blood sugar and suppress or relieve overwhelming food/eating desires; often the tea has been too flavorful to drink, particularly it seems, for the biggest fans of refined sugars and white flour products. The treatment is often effective in less than ten days; and, if not showing positive results by two weeks, may not be effective for some recalcitrant sweet food fans. I suggest devil's club tea, tincture, or capsules for most blood sugar imbalance problems in addition for the earlier stages of type II diabetes. I tend to use single herbs rather than formulas. Other herbalists frequently include devil's club in formulas for treating blood sugar imbalances. Severe diet and behavior modification is an essential part of all treatment plans. For those patients with sugar blues, it is not only helpful in modulating blood sugar release and utilization, but there is often a distinct mood enhancement and improved sense of well-being. Occasionally there are brief psychogenic episodes with mild euphoria and a "don't care" attitude. I like to have these treatments last for 10 -14 days and then evaluate the patient before continuing Devil's Club usage. Devil's Club has a great reputation for relief from arthritis and rheumatism but little seems known of either mechanisms or dosages. I have no direct experience with this use of Oplopanax. The high cost of both live or dried material may prohibit use outside its natural habitat as a whole body soaking herb. I am preparing topical oils and salves to test for effectiveness in treating chronic joint pains. The question is whether the effect is to lessen pain as an analgesic, or to stimulate tissue repair and eventual pain resolution. Some herbalists have been promoting devil's club for weight loss. Certainly the loss of appetite from Oplopanax tea, tincture or live bark consumption promotes weight loss in the short term. If taken continually, regularly, weight loss stops in 3-4 months and a great appetite develops and lost weight and more can be found in the usual places. Annie York, one of Nancy Turner's informants in Thompson Ethnobotany, gleefully remarks on this phenomenon, long known in native traditions. So, I strongly advise against using Devil's Club for weight loss per se, except perhaps in the shortest term. The use of Devil's Club to stop breast milk flow and to initiate menstruation post partum strongly suggests that this herb effects estrogen metabolism; the antihyperthyroid activity suggests further endocrine involvement as does the resolution of type II diabetes. I suspect that the weight loss action is affected by thyroid suppression in either the pituitary or hypothalamus, as a progressive state of minimal hypothyroidism develops. The post-consumption lethargy experienced by many may be thyrosuppression. Certainly the eventual return of lost weight and further weight gain support the hypothyroid idea. The long term use of small amounts of Devil's Club may act as both an adaptogenic and endocrine tonic. The plant's use in treating skin and gynecological cancers usually involves drinking 1-2 pints per day of strong decoction of the root and stem barks from fresh material. I have no direct experience with this application. A lovely structural feature of Devil's Club is the growth of small buds from recumbent stems; these small buds grow vertically from the horizontal stems; they grow both outward and inward from the thick bark, producing exquisite little totally enspined shoots outside the bark; and within, the base of the shoot grows up to 10 long horizontal woody fingers which clasp the recumbent stem as if two hands in prayer; as the sprout ages and becomes a large stem, the subtending supine stem changes morphologically from a stem to a root, looses its spine sheath, and grows roots on the earth side and slowly disappears as duff covers it. The long woody fingers grow into and fuse with the wood of the recumbent stem. These sprout bases are sometimes found when stripping the bark and make beautiful reminders of Devil's Club's special powers. there is some real concern that increasing medicinal use of Devil's Club may threaten its survival in the wild; it seems to not like cultivation much from my own personal attempts to transplant it; field cultivation is probably unlikely if not impossible, but wild cultivation is likely in the correct habitats. At present the amazing vast patches of Oplopanax seem unlikely to ever be totally harvested. But, it is not just harvest pressure that threatens this plant; habitat destruction by destructive tax-payer -supported logging is the real threat. Development of rainforest lands need not necessarily eliminate Oplopanax; it seems to thrive in second growth developments left wooded; some say too well. The various North American species of Oregon Grape tend to be modest long-lived woody-stemmed perennials. Handsome well-behaved evergreen horticultural varieties abound as ornamentals and streamside and roadside erosion control plantings. Most species transplant readily from wild to semi-and domestic sites. The northern species (M. aquifolium and M. nervosa), usually do not favor full sun. Medicinally active Mahonia species are abundant from Alaska to Northern Mexico and east to the eastern edges of the Rocky Mountains; except for horticultural and ornamental plantings, I believe they are truly a western genus, not occurring as native plants east of the Rockies. They can be found in both rain forests and xeric lands. There are differences in individual species as regards both constituent's content and medicinal efficacy (refs.). Mahonia nervosa is my favorite species. I have lived closely and intimately with this wonderful plant for over thirty years. It was and is used extensively in folk medicine by both coastal indigenes and recent Anglo invaders. Like most Mahonias it has spiny-margined leaflets arranged in lovely pinnately-compound leaves; each leaflet resembles a simple holly leaf. Before proceeding to the topics of therapeutics and harvesting, I'd like to discuss the powerful constituent reality of M. nervosa: the combined nine and more alkaloids in the soft bark inner tissues and occasionally the inner wood (and seldom in the inner pith of the emergent stems) of Mahonia nervosa are extractable in aqueous and water-alcohol solutions. The resulting extracts have demonstrated strong, broad-spectrum antimicrobial activity against viruses(herpes, hepatitis), bacteria ( both Gram-negative and Gram-positive, as well as Chlamydia), fungi(Candida), and protozoa(Amoeba, Giardia, malaria) (l). Presumably these same alkaloids are used by the Oregon grape to protect the recumbent stems and rhizomes against unwanted soil microbial invasion and infestation; sometimes the central pith of either the stem or rhizome will be discolored light tan to brown to black as a consequence of microbial, mostly fungal, invasion of the inner pith where the alkaloid concentration is least; fungal entry seems to be by mechanical damage from insects or forest floor disruption. The outer bark layer of underground Mahonia rhizomes is particularly thin, easily rubbed away with a light finger pressure. The plants seem to be very structure-conservative , using chemical defenses instead of bulky thick bark layers. Francis Brinker, ND, has published an excellent thorough and well-referenced to primary sources' discussion of Mahonia alkaloids and their respective therapeutic applications and potentials, particularly berberine(1). Berberine is the most abundant and therapeutically dominant Oregon grape alkaloid; it is soluble in cold water and less soluble in ethanol than in water. Hyper cautious non-practicing authors warn of a potential toxic hazard from the use and or consumption of Mahonia teas or extracts due to the berberine presence (3,5). These authors offer no references to primary sources or referenced case studies that might provide authentic empirical data demonstrating genuine human health hazards from the use of Mahonia teas or extracts. The potential hazards are extrapolated apparently from caged animal experiments using isolated, purified berberine, not simple extracts of Mahonia spp. 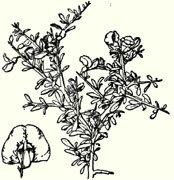 The berberine in animal experiments was often administered either subcutaneously or intravenously; both procedures tend to be outside the usual scope of practice for most herbalists. There are no known reports of adverse reactions to Mahonia teas or extracts from herbal practitioners or users that I can locate. The most probable hazard is the miscarriage potential; no cases reported yet. The relatively poor body uptake of berberine reduces its potential hazard. Most Mahonia medicine uses teas and extracts of stem and rhizome pieces both externally and internally. Some folk traditions do use Mahonia leaf teas, powders, and extracts (1), I do not, yet. One of the best summaries of the real therapeutic uses of Mahonia is in Dr. Christopher's book, The School of Natural Healing (2). Dried leaf has reportedly been used as an antimicrobial styptic for skin abrasions and to topically calm herpes and psoriasis skin lesions (?). I usually recommend strong Mahonia nervosa decocted tea for herpes and psoriasis patients; the functional dosage is roughly one to two 8-oz cups of a 2 to 12 hr-steeped decoction two to four times a week. This usually results in a noticeable lessening of symptom severity. Less-defined eczema and rashes often resolve with 2-10 weeks of M. nervosa tea usage: the action here may be due to a combination of improved liver and kidney excretory function, antifungal or antibacterial activity, and, possibly mild thyroid stimulation (6). I frequently recommend Oregon Grape tea as a long-term liver tonic drink accompanied by abundant consumption of fresh (when available) or dried dandelion greens, at least 3 or 4 ounces of fresh material daily to those who have abused or treated (the exact definitions vary) themselves with ample alcoholic beverages. Simple aqueous and ethanol-water extracts of Mahonia spp. exert a patient positive effect on all body symptoms and tissues in my experience. The primary actions are: improved bilary flow and excretion, enhanced kidney function, antimicrobial action, and spasmolytic toning of smooth muscle tissue. The improved bile flow in particular results in better digestion, better appetite, and better elimination of stool; and, in women, a lessening of PMS symptom severity. Boldly place the infected hand into the hot decoction in the dish, making sure that it is completely submerged; cover to retain heat and slow cooling; soak until the decoction has cooled; reheat and repeat the soaking; (A nice feature of the stainless dish is that it can be placed directly on a stove for reheating.) soak for at least an hour the first time. Continue to drink at least 48 oz (3 pints) of the strong decocted, steeped tea every day for at least 14 days, in four 12-oz doses. Consume all of the tea in each potful. Reboil for a minute or two every 12 hours to retard spoilage. Do not refrigerate. Contact me immediately by cell phone or "footpath telegraph" if symptoms worsen or do not show improvement within 48 hours. Most of her friends and family were not supportive of her choice to use herbs instead of flying off to the mainland to receive emergency medical attention and a probable strong antibiotic treatment probably intravenously. Certainly the ghastly appearance of the hand was alarming. She resisted and persisted with the Oregon grape regime I had suggested. She was very much against using prescription antibiotics. If her symptoms had seriously worsened, I would have either tried stronger herbs or conceded to IV antibiotic(s) in an obvious life-threatening situation. Previous success with apparent localized Gram positive infections using Oregon grape allowed me a certain confidence in probable success. Her symptoms did not noticeably improve until after 24 hours, and then did improve rapidly until most symptoms had subsided by 5 or 6 days after starting the Oregon grape treatment. Soreness, discoloration, some cavitation, and shedding continued until 18-20 days ; complete resolution and superficial healing had occurred by week 5 with no recurrence. The woman continued to drink at least 12 ounces of strong decoction daily through week 6. Oregon grape woody part decoctions become progressively stronger medicinally from prolonged steeping (24-72 hours) and repeated short daily reboiling ( 1-2 minutes). I have also re-decocted the same batch of stem and root material three times with strong tea still produced from the third decoction. A good strong Mahonia decoction is a dark orange-brown color with a mildly bittersweet flavor. It can act as both a mild diuretic and laxative. When children (or, rarely, adults) present with obvious impetigo sores, I treat them with an equal mixture of strong tinctures of Oregon grape and Grindelia applied topically 4-6 times daily until resolved. Sanitary rigor improves the likelihood of positive outcome. A thirty year old woman came to see me. Her arms, modestly exposed chest, neck and face presented numerous angry raised sores and eruptions and attendant scars from previous sores. The sores first appeared abruptly nearly a year previously. No one consulted medically seemed to know how to treat them successfully. Since she was finishing acupuncture school at the time I was surprised. For her I felt that suggesting teas and prolonged external soaks might result in poor compliance. I recommended tinctures for her: unsure of the exact nature of her presentation but suspecting one or more infectious Gram positive bacteria, probably Staphylococcus aureus (a bacterium I had worked with in graduate school) I had her use an equal parts mixture of Usnea and Grindelia tinctures topically on all sores and inflamed surfaces; internally she took a 5 cc dose of strong Mahonia tincture three times a day. In a week she was 80% better, in two weeks, 90% better, in a month, all symptoms had resolved and she was amazed. Everything had cleared up and there was no recurrence in the four years until I saw her again. She had continued to take the Mahonia tincture for 6 months. Today she bears no signs of a once terrible disfigurement. Giardia is an octoflagellated protozoan spread usually by infested water and occasionally by food or sexual contact. Animal sources are: monkeys, pigs, dogs, beavers, and probably rodents, horses, sheep, deer, cattle, and cats. Where Giardia is endemic, people have no symptoms. It is now the most frequently identified intestinal parasite in public health labs in the United States, and the most frequently defined cause of waterborne diarrhea outbreaks. Its cysts can survive in surface water for at least 3 months; standard drinking water chlorination does not kill the cysts. The cysts pass through the stomach unharmed and by some as yet unexplained mechanism, attach to the villus (epithelial brush border) surfaces in crypts in the duodenum and jejunum. There they quickly form 2 trophozoites, dissolve the cyst capsule, and release the trophozoites; these have four pairs of flagella each which allows swimming-feeding or browsing on our microvillar surfaces. A very clever suction disk device (brush like sucker plate) on each Giardia anterior surface allows tight adhesion to intestinal surfaces. Swimming Giardia can invade the common bile duct and liver; which means chronic Giardia infestations can present as liver or gallbladder problems. Chronic Giardia can produce clinical manifestations by suppressing adequate absorption of fats, carbohydrates, B12,, all fat- soluble vitamins, AND CALCIUM. Stress and any immunosuppressive factor can initiate an acute phase in chronic cases. The presenting symptoms of great abdominal discomfort, loose, watery, greasy, foul-smelling, almost never bloody stools, belching, intense borborygmus, and bouts of constipation can be either debilitating, barely noticeable or a Giardia carrier may be apparently asymptomatic. 50-70% of Giardia carriers are asymptomatic. Giardia is rarely detected in older adults. For known, tested Giardia cases I use strong-steeped Oregon grape decoction taken every six hours in acute cases and once or twice a day for chronic cases in 12 to 16 oz doses daily for 4 weeks; and then suggest a retest for Giardia, continuing to take the tea until the test results are known. If the test comes back negative, consider having a retest in a week or two to help rule out a false negative. If the test comes back positive, continue the Mahonia teas until a negative test obtains, testing once every 4-6 weeks. The most persistent case in my experience took 4 months of daily decocted tea to resolve. I have not obtained Giardia clearance with tinctures of Mahonia. The decocted Oregon grape teas apparently do not kill the Giardia cells but rather render the intestinal environment Giardia unfriendly and the little rascals detach and leave in the stool. I believe the mechanism is disruption of suction disk microfibrils by berberine and possibly other Mahonia alkaloids, similar to the known smooth muscle spasmolytic action of Berberine. In my experience, all compliant cases of known Giardia infestation have cleared when treated with strong Mahonia nervosa decoction as determined by stool exam. Some periodontal gum disease can be suppressed or even cleared by persistent treatment with Mahonia strong decoctions. The procedure is simple: hold an ounce or more of the decoction in the mouth for 15-20 minutes at least once daily, although twice daily is better, morning and evening. In the old days when I was first starting my herbal practice I was happy to teach my friends and those who were interested, how to prepare teas and rinses of M. nervosa to treat simple infections, especially impetigo. This information got passed around to off islanders and came back as tales of complete failures in several affected households. I was initially worried that they had encountered some horrible strains of "super bacteria" totally resistant to herbal antibiotics. The real problem was the source of the Oregon grape material used to make the medicines: the material was purchased at food coops or natural food stores; it was pale yellow to off-white in color and consisted of woody chips without any bark, and no dark yellow-orange wood. The bark had either all been removed, or the material had previously been extracted and then sold as Oregon Grape Roots, which was of course technically true. Instead of a rich orange-brown decoction, these samples gave only light yellow decoctions even with 24-hr steeping. There were no positive patient outcomes; the material was unsuitable for functional medicine. Nearly twenty years later similar useless material is sold by several large distributors of bulk herbs. Please beware when purchasing alleged Oregon Grape Roots: make sure they are dark yellow-orange and still have the bark on.. I believe the practice of selling debarked worthless material constitutes functional fraud. Further negative events affect product quality. In the Pacific Northwest, Mahonia spp. are harvested by loggers and other forestry workers left with the stumps and mutilated landscapes characteristic of clear-cutting. Their favorite practice is to follow the road-building dozers or even the log skidders and gather the freshly exposed underground Mahonia rhizomes and also rescue the mutilated stems from furrows and mounds of topsoil churned by the enormous treads and tracks of the logging equipment. These poor pieces are tied into modular raggedy bundles of about 25 # and stacked outside until a buyer comes buy to pay about $1.00 per pound for an entire truckload; sometimes it is a month or more before the buyer takes the material away after it has been exposed to a lot of rain and occasional sun; the berberine yellow seems to fade and the bark partially dries. I was surprised and shocked to hear of some of my fellow wildcrafters cheerfully following the big equipment for easy harvesting. I tried it once and the torn, mutilated pieces were totally unacceptable to me for medicine; how could these mangled scraps of noble plant be expected to yield good medicine? Just recently, the herb buyer for Herb-Pharm (T.H.) visited a relative newcomer to the wildcrafting business to see how he harvested Oregon Grape Roots; this man had advertised his product as totally ethically wildcrafted, hand-harvested and gently cared for throughout the harvest. T. was taken to a woodland site and given a bit of a demo. He was pleased and placed an order, marveling at the relatively low cost per pound, and went on his way. Some time later he thought he would just stop by for an unannounced visit to the harvester at work; he was totally shocked to see the man using a rented backhoe to rip out the plants and then stuff them unwashed thru a gasoline-driven chipper/shredder next to his pickup truck, and then they were hauled off to hot-air drying. When T. complained, the man said "people love my stuff". T. cancelled his order nonetheless. ( Pers. Comm to R.D.) Healing intent and efficacy begins with the decision to harvest. I believe that the destructive/violent energy used to harvest that Oregon Grape reduced or even destroyed all but the grossest therapeutic activities. The exposure of the product to gasoline engine exhaust fumes and particles further compromises the herb's healing potentials. Most of us do not suspect that the greatest hazard to Mahonia spp., at least in the Pacific Northwest, does not come from medicinal harvesters or simple loss of habitat from logging and developmental human settlement sprawl. It comes from the nearly 20,000 NTFP (non timber forest products) industry workers who pick mushrooms and "brush". The lovely long-lasting Mahonia leaves are prized for floral displays; hundreds of huge shipping containers full of only the best Mahonia leaves are exported each year from the west coast rain forests. Over 90% of brush pickers are recent immigrants or migrant workers; English is often a distant second language. They cannot be expected to protect the resource. Their relative poverty also mitigates against the niceties of protecting the plants; they are more concerned with picking more pieces to protect their families. There are several well-intentioned efforts to organize these people to not only raise their wages and improve their working conditions, but also to raise the picker's sense of sustainable harvesting. I have great hopes for these efforts. Chaparral defines and dominates the 35 million acres where it grows, from the burning sands of Death Valley to the dry lands of West Texas to the lonely barren mountains of the Sonoran and Mojave deserts, north into California, Arizona, and Nevada, and south into Mexico. Unlike Oregon Grape and Devil's Club, which are both dominant understory shrubby plants beneath towering conifers, Chaparral is the upper story plant where it grows, reaching heights of 12-15 feet at the most (3-4m). Often it is the ONLY distinguishable plant. This is not only due to the extreme heat and dryness of its home, but also to active killing and suppression of other plants through aggressive secretion of germination and growth inhibitors. An established chaparral plant will also secrete substances which suppress the germination of its own and other chaparral plants' seeds. Like the Oregon Grape, it is an evergreen and its leaves can persist for several years; leaf size responds to recent rainfall, with smaller leaves in drier times. Most individual plants live for several hundred years. The oldest known plants of any kind are some chaparral bushes in the Empty Triangle where California, Arizona, and Nevada meet in the Mojave Desert. They are carbon-dated to at least 11,500 years. They are protected by continual security. A fascinating plant geographical factoid which relates to medicinal efficacy is: the Chaparral plants in Texas are diploid, the plants in the Sonoran are tetraploid, and the Mojave plants are hexaploid. The most important, in terms of percentages and antioxidant activity, constituent, NDGA (nordihydroguairetic acid), is more abundant in the Mojave plants. I harvest my Chaparral in the Mojave. NDGA is also considered the most important medicinal constituent (1). It is about 40% extracted in hot water. One curious note is the recent concern over Chaparral as a poisonous plant. The concerns are probably valid for those individuals who are liver-compromised as a consequence of HIV, viral Hepatitis, and drug or alcohol hepatic damage (5). Extracts of chaparral do seem to suppress hepatic enzyme function. According to Brinker, most of the cases of known Chaparral poisoning and liver damage favorably resolved when Chaparral was withdrawn(1). There have been no serious side effects in most people, even with high doses used to treat cancer. There are no deaths attributed to Chaparral. Indigenes, and later the Hispanic colonials, in the Sonoran and Mojave used chaparral to keep animal and vegetable fats and oils from rancidifying. I have kept lard for a decade with a handful of chaparral leaves placed in a pint of hot lard just out of the rendering vat. The flavor is strong but self-recommending; the lard was yummy on popcorn and for frying eggs. The strong antioxidant activity of NDGA is responsible; so much so that tons of Chaparral were used to make crude extracts then used to keep commercial cookies, crackers, and other butter-containing flour products from becoming rancid. Prior to that, there apparently was no reliable butter antioxidant. With the replacement of butter by transfatty acids, rancidity was no longer a concern for packaged flour products and chaparral extraction was discontinued. Just like Devil's Club, Chaparral was" used for everything ", and called the Governor by those who lived in its home. It was not eaten except to quell gastric upset. I use it fresh with olive oil on bread for apparent food poisoning or dirty water diarrhea; also as an adjunct therapy for respiratory infections. Effective treatments for arthritis and rheumatism involve soaking for an hour or more in hot chaparral baths for no more than three days; the baths are followed by daily poultices of the plant or its water or alcohol extracts over painful areas. It tends to act as a powerful topical anti-inflammatory. For some, an oil infusion made with equal parts oil and chaparral material and kept hot for 4-8 hours (up to 200 degrees F, although I prefer to heat no higher than 150 degrees F.) and then strained or pressed, is more effective for sore and painful joints, when applied locally. I believe that the caution against repeated, prolonged, or excessive whole-body soaking in Chaparral baths is from observed mild jaundice and painful livers from transdermal movements of hepatotoxic material into the body. I have not experienced this myself nor have my patients, as far as I know. Some folk traditions recommend only two baths per year to kill any and all ectoparasites (lice and scabies; from Sam Hicks" privately published Of Desert Plants and Peoples, 1942). Epidermal fungal infestations are often resistant to eradication. I have found no particular relief for the various Tinnea spp. using chaparral. It does seem very effective against small scaly ringworm patches that do not spread or itch. I think these tend to be pet-sourced. The well-known and feared itch intradermal parasite yields to topical applications of Larrea as strong hot water extracts or 50% alcohol extracts applied to the lesion areas . A prolonged (1-2 hour very hot (108 degrees) near-total immersion bath helps with a big pile of dried Chaparral added so that the body is soaking in a strong Chaparral infusion. Either treatment can work separately, but the two together are nearly 100% effective. I have not seen any adverse reactions except some dislike for the strong aroma of the Chaparral. Chaparral contains over 600 medicinally active ingredients; some of these are extremely antimicrobial against both Gram positive and Gram negative bacteria. In one case, a 10-yr-old male presented with an abscessing lower molar; the gum was very swollen and tender. I used a strong (1:1) 50% alcohol extract of chaparral directly on the inflamed area at thirty minute intervals for 8 hours and then once every 4 hours. The swelling subsided at the end of eight hours and all signs of inflammation resolved in 48 hours. The inflammation did not recur. I was using both the strong anti-inflammatory and the antimicrobial activity of the Chaparral. I suspected that some coarse food particle(s) had lodged deep between the gum and the tooth and driven aerobic bacteria into an anaerobic growth phase. No initiating trauma was identified. If there had been less acute inflammation, I may have used a different botanical. The reasoning was as follows: I already knew from previous cases that Chaparral could help resolve resistant respiratory infections, but those had been more chronic and less immediately life-threatening/debilitating and could be dealt with leisurely; I wanted to use as many possible entry vectors to get the many Larrea active constituents into the patient; that meant water-soluble, alcohol soluble, steam-vaporized, and through digestive selection. If resolution had not initiated noticeably within 3-4 days, I would have added topical oil and or hot compresses across his chest alternated with hot compresses across his back. He did improve dramatically and the entire condition had 90% resolved in two weeks and strength and vitality returned to normal within two months. I was elated and so was he. Only later did we learn that his primary care physician had given up hope and was considering the very strong multiple antibiotics as a sort of shotgun desperate measure; what I tried with Chaparral was similar. I felt that the hepatic risk was worth it and hoped that the man had a strong enough constitution to survive the herbal onslaught. Nearly a decade later we met after several years not seeing each other and we chatted briefly about the case; he reaffirmed his gratitude and his disbelief that he actually complied with my instructions. He expressed a fondness for the aroma of Chaparral but did not want to consume any, ever. He also mentioned he was sure he was going to die then, either from his affliction or the proposed medications and never see his newborn son grow up. I strongly disagree with the generalized castigation of Larrea tridentata as an internal herb both as the plant and as extracts. The apparent success of other practitioners using this plant to treat melanoma and uterine fibroids suggests an expanding use is in order. I have not managed any cases of either melanoma or uterine fibroids with Chaparral. It is an abundant plant and could be harvested in a conservative and sustainable way probably indefinitely. When traveling abroad, the only herb I carry with me is dried Chaparral. Brinker, F. 1993. Native Healing Gifts. Eclectic Medical Publications, Sandy, Oregon. pp. 91-96. Christopher, J. 1976. School of Natural Healing. Biworld. pp.72-75. Duke, J. 1985. Handbook of Medicinal Herbs. CRC Press. pp. 287-8. Moore, M. 1979. Medicinal Plants of The Mountain West. Mus. NM Press. pp. 117-9.Tilford, G. 1997. Edible and Medicinal Plants of the West. Mountain Press. pp. 104-5. Turner, N. 1985. Food Plants of British Columbia. Prov. Mus. Pub. Turner, N. 1982. Traditional Use of Devil's Club by Native Peoples In Western North America. J. Ethnobiolog 2:17-38.